I just read teknoupdate from BlackBerry world, there is a leak about the latest BlackBerry phones will be available in 2011, available soon BlackBerry Dakota (successor Bold) and BlackBerry Apollo (successor Curve). This time based on the latest leaked release schedule is also seen tablets BlackBerry Playbook and CDMA BlackBerry phone will fill this year. the schedule for CDMA version and then GSM version will be present this year. - Tipe Blackberry - Blackberry roadmap 2012. 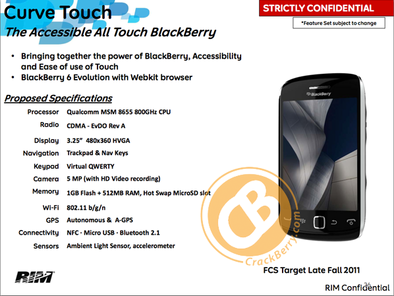 * Touch-screen BlackBerry Bold: version = Dakota GSM, CDMA version = Montana. All BlackBerry phones will later be implanted BlackBerry OS 6.1 has been announced in Asia DevCon event in Bali some time ago. Various advantages will be offered in the latest BlackBerry OS, among others, better graphics, magnetometer, NFC, support more media rich with HTML5, HD video recording, a deeper social integration, better search features, personalized look, updates the virtual keyboard , enhanced browsing, and much more. i really don't know yet about the price range for each BlackBerry mobile phone that will be present. Maybe in the next leak. thanks for the info .... i'll be back soon!! Thank you for the infographics. Any updates regarding this post? I just bought my blackberry at iunlockblackberry.com and it was working well with me.